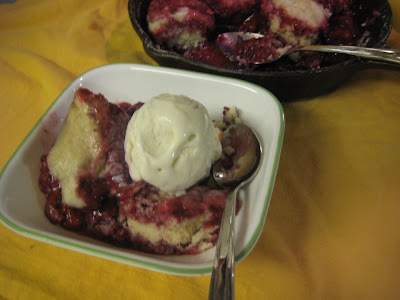 Slumps (or Grunts, as they're sometimes called) are similar to cobblers, but they're topped with soft dumplings. The fruit "grunts" as it cooks and the dumplings "slump" into the fruit as they set up. This is one of those dishes that's absurdly easy to make and it's ready in minutes. Since you "bake" it in a skillet on the stove top, it's the perfect dessert to make when your oven is busy or during a hot summer day when you don't feel like turning the oven on! Gently toss raspberries, 1/2 cup sugar, water, lemon juice and cinnamon in a 9-inch, heavy skillet with a domed lid (or use an upside-down pot or heat proof bowl as a lid). In a mixing bowl, whisk or sift together the flour, remaining sugar, baking powder and salt. Add cream. Stir just until mixture forms a soft dough. Heat berry mixture to boiling over medium heat. Reduce heat to medium-low. Drop tablespoons of dough over the top of the fruit. Cover and simmer until dumplings are set and tops are dry, about 15 minutes. Serve hot or warm. For a little extra added sweetness, sprinkle a little granulated sugar over dough after it has finished cooking. Try any other combination of fruit such as peaches, blueberries, and blackberries. You might need to add a little extra cream to pull the dough together. As my Mom would say, "Just add it a few drops at a time until it's enough!"